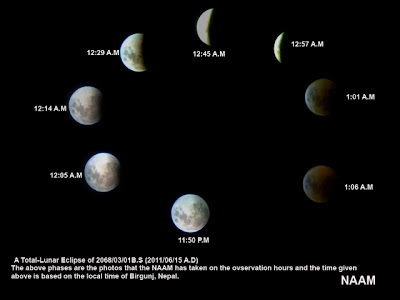 The first Total Lunar Eclipse of 2011 brought great excitement among the amateur astronomers of Nepal.observe this historical eclipse,Nepal Astronomical Society(NASO), Kathmandu and Nepali Association for Astronomical Mission(NAAM) Birgunj,Nepal had organized doouble stationed observation of TLE from Nepal.before, NASO has spread the news among the nepalese through different media. " We have been busy answering the questions from the media as an live on FM radios from different parts of Nepal", said the Rishi Shah,Academician of Nepal Academy of Science and Technology (NAST) and President of NASO. We have tried to dissiminate the right information to every corner of Nepal through TVs, Radios and newspaper", explained Mr. Suresh Bhattarai, Secretary of NASO.